This is a major breakthrough towards a full, practical quantum network. In a massive step forward, researchers have sent the first quantum-secured message through the air above a city containing more than one bit of information. This proof-of-concept success means that high-capacity, free-space quantum communication will one day be both a practical and secure process between satellites and Earth—and a worldwide quantum encryption network will also be feasible. 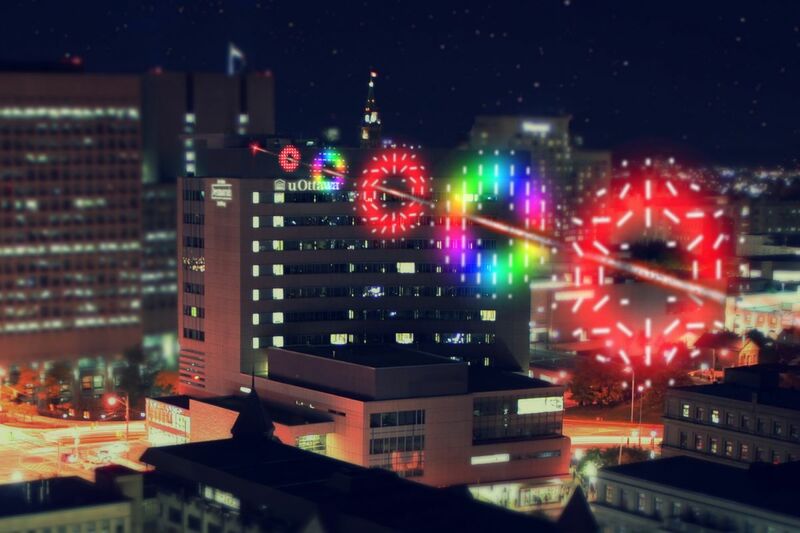 In their demonstration, researchers used 4D quantum encryption to transmit data over a free-space optical network between two buildings. The buildings on the University of Ottawa campus stand 0.3 kilometers apart. The high-dimensional encryption scheme is described as “4D” because it sends more information, as every photon encodes two bits of information. This, in turn, means that each photon carries four possibilities with it: 00, 01, 10, or 11. High-dimensional quantum encryption is also more secure because it can tolerate more signal-obscuring noise such as noise from failed electronics, turbulent air, malfunctioning detectors, and even interception attempts without rendering the transmission unsecured. “This higher noise threshold means that when 2D quantum encryption fails, you can try to implement 4D because it, in principle, is more secure and more noise resistant,” Ebrahim Karimi said in a news release. Current algorithms are unlikely to be secure in the future as computers become more powerful. Therefore, researchers are working to master stronger encryption techniques such as light-harnessing quantum key distribution, which uses the quantum states of light particles to encode and send the decryption keys for encoded data. Now, the concept of quantum communications like this has been a theoretical concept until recently, because global implementation will demand transmission between Earth and satellites. Scientists have been using horizontal tests through the air over distances because the distortion that signals encounter can mimic what they might go through as they pass through the atmosphere. This successful demonstration proved that successful encryption is possible, despite distortion. These researchers ported their optical setups from the lab to two different rooftops for the testing and protected them from the elements with wooden boxes. After some trial and error, the team successfully used this intracity link to send secure messages using 4D quantum encryption. The error rate for the messages was 11 percent, well below the 19 percent secure connection threshold. The team also compared 4D and 2D encryption, and they found that they were able to transmit 1.6 times more data per photon after error correction using 4D quantum encryption, in spite of turbulence. Next, this research team plans to test the technology in a three-link network that spans longer distances, with each link about 5.6 kilometers apart. They will also use adaptive optics technology to compensate for the turbulence. The long-term goal is to link the network to the existing city network, creating “a quantum communication network with multiple links but using more than four dimensions while trying to get around the turbulence,” graduate student and team member Alicia Sit said in the press release.